A sport game that plays volleyball matches. The authors made it possible to take control of one of the sixty national teams and then direct it in one of the three basic modes of play: cups, championships and finals. 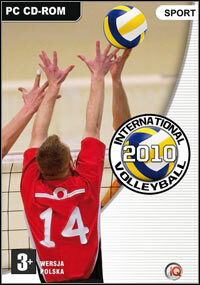 International Volleyball 2010 is a sports game that allows you to simulate volleyball games. IQ Publishing is responsible for the preparation of this production. The list of play modes available in the game includes three main items - cups, championships and finals. An important feature of this production is that we can take part in competitions of both male and female teams, choosing from among about sixty licensed national teams. We can lead the struggle alone, thus facing the advanced artificial intelligence, or invite live players to play and organize matches in a group. This game is characterized by an extensive control model, which can meet the expectations of both less experienced players and fans of this sport. The list of available moves, in addition to standard actions, such as attack or block, also includes many different types of servers and ball games. All this allows you to develop your own game tactics and to better respond to the actions of a competitive team. At any time of the game we can also display extended windows with statistics, helping to choose the right strategy or to examine the effectiveness of specific players. Game score 8.1 / 10 calculated out of 408 players' votes.